The Rhodes Diagoras International Airport is one of Greece's busiest, handling more than four million passengers a year, most of which arrive here in the summer months. The airport has one terminal and runway, and is located close to Rhodes Town and the main beach resort town of Faliraki. Gone are the days when the island was mainly served by holiday charters and mainland Greece carriers, with many budget airlines also serving the island nowadays. They include EasyJet, Ryanair, Flybe, Germanwings, Transavia and Wizz Air, amongst others, while major airlines British Airways, Thomson Airways, Air Berlin and Aegean Airlines also fly here. The current incarnation of Rhodes Airport hails from the late 1970s, with the complex having gained a new wing in 2006 / 2007 for charter flights. Most charters fly here in the summer months, when hordes of holiday makers visit for the sun, sea and spectacular ancient ruins. 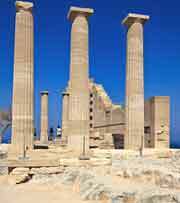 This hub is located 16 km / 10 miles to the west of Rhodes Town, in the area of Paradissi. The airport resides on the coast and is connected to the town via Leoforos Eleftherias, which goes through Kremasti. Of note, Rhodes Airport has just one terminal. The two-lane Leoforos Eleftherias road runs direct from the airport to Rhodes Town, which is a 20-minutes drive to the north-east. There is also a road that loops around the island and serves all coastal resorts. You can get to Faliraki, one of the main resorts, by cutting across the island using Pros Pastida. The drive along this particular route takes about 20 minutes. Book your Rhodes Car Rental here. Public buses run from the bus stop just outside of the airport grounds, taking roughly 40 minutes to reach Rhodes Town. They also head west, although it is often sensible to make use of the shuttle buses. Package tourists will usually get transport included with their holiday, while big resort hotels frequently have their own buses. 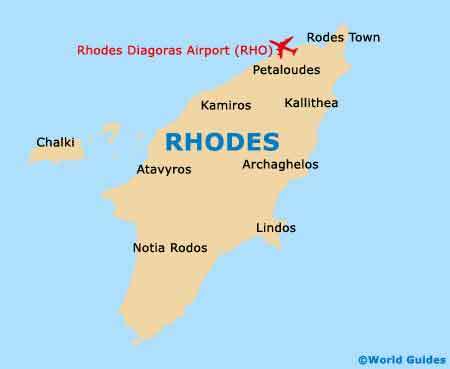 Taxis are always available and depart from the Arrivals area of the Rhodes Diagoras International Airport. There is a list of prices in Arrivals which includes the maximum fare passengers should pay, although it is best to check the price with the driver before actually getting in the taxi. The normal fare to Faliraki is reasonable. Official onsite taxis are easy to spot, being dark blue in colour.